A dollar-denominated central bank certificate created to encourage the investment of undeclared funds in Argentina’s flagging real estate market will fail to reverse a decline in transactions, according to 67 percent of respondents in a survey by website Reporte Inmobiliario. About 30 percent of the 984 people questioned said the new instrument, created to inject funds that hadn’t been declared to the Argentine tax agency into the economy, will help boost property purchases. Real estate transactions plunged since President Cristina Fernandez de Kirchner tightened controls on the foreign exchange market after being re-elected in October 2011. She banned purchases of dollars for savings and for real estate transactions, which traditionally are carried out in greenbacks, Reporte Inmobiliario director Jose Rozados said on the website. Last year “was the worse since 1980 in real estate transactions in the city of Buenos Aires,” Rozados said. Sales in the city fell 48 percent in the first quarter from the same period two years earlier, before access to dollars was restricted, according to the capital’s public notaries’ college. Construction activity has fallen in 11 of the past 13 months on a year-on-year basis, government data show. Last week, Congress approved legislation that pardons tax dodgers who invest their undeclared funds in either the construction industry by using the central bank certificates or buy bonds that will be used to finance increased oil and gas production. The government says the legislation will help bring part of the $160 billion Argentines hide from the authorities into the economy. While the peso fell 7.1 percent this year to 5.2915 per dollar today, the currency in the illegal market fell 20 percent to 8.54 per dollar, according to Ambito Financiero website. This entry was posted in English, Real Estate and tagged argentina, attorney, buenos aires, law firm, law office, lawyer, legal, real estate on June 5, 2013 by Elias Kier Joffe. BUENOS AIRES–Argentina’s construction activity showed a moderate rebound in April, although the pace of building continues to suffer from government capital controls that have made the U.S. dollars traditionally used for real-estate transactions scarce. Construction activity in April was up 3.6% on the year, but down 2.3% on the month, the national statistics agency, Indec, reported Friday. Construction started to show small gains starting in February, but it has been slow to recover from a contraction last year. In 2012, construction was down 3.2% on the year, according to Indec. In a bid to slow capital flight, the government has made it all but impossible for most people to legally buy dollars. The limits were first imposed in late 2011, but have been progressively stepped up since then. That has rattled the real-estate and construction sectors, where values are usually pegged in dollars due to the country’s long history of inflation and repeated devaluations of the peso. This entry was posted in English, Real Estate and tagged argentina, attorney, buenos aires, law firm, law office, lawyer, legal, real estate on May 31, 2013 by Elias Kier Joffe. BUENOS AIRES–Argentina’s government will ask Congress to approve legislation that will allow Argentines to invest their undeclared U.S. dollar savings in local bonds to finance energy and construction projects, Economy Minister Hernan Lorenzino said Tuesday. Argentines are thought to hold tens of billions of undeclared dollars in Argentina or offshore bank accounts. Mr. Lorenzino’s announcement coincides with the weakening of the Argentine peso to historic levels against the dollar on the black market. At the same time, the central bank has struggled to rebuild its foreign currency reserves due in part to persistent capital outflows. “People might have their cash in a safety deposit box, or under the bed, or worse, in a tax haven. This [measure] means taking those resources and incorporating them into the productive sector,” Mr. Lorenzino said in a televised press conference. Mr. Lorenzino said the administration of President Cristina Kirchner will submit the legislation to Congress immediately. All the senior members of Mrs. Kirchner’s economic team were present at the event: Commerce Secretary Guillermo Moreno, who is in charge of import and price controls; Deputy Economy Minister Axel Kicillof; Central Bank President Mercedes Marco del Pont; and tax chief Ricardo Echegaray. Argentines have long viewed the dollar as a store of value due to their country’s long history of high inflation and economic crisis that frequently ended in major devaluations of the peso. The unrelenting weakness of the peso on the black market in the last six months is feeding fears that a devaluation might be in the works, and stoking even more demand for scarce dollars. In an attempt to calm the public, Mrs. Kirchner said Monday that her administration won’t devalue the peso. Inflation that most economists say is around 24% a year coupled with government restrictions on the dollars people and businesses can legally purchase are driving some Argentines into the arms of black market currency dealers. The peso has lost about 64 cents this month to set a record low of around 10.04 to the dollar Tuesday, according to newspaper El Cronista, which publishes an average of underground exchange rates. The black market is thought to be small, but does influence prices in some parts of the economy, especially real estate, which for decades has overwhelmingly used the dollar in transactions. On the regulated currency market the dollar sold for 5.2090 pesos, though dollar rationing means that for most Argentines the official exchange rate is a mirage. This entry was posted in English, Real Estate and tagged argentina, attorney, buenos aires, law firm, law office, lawyer, legal, real estate on May 7, 2013 by Elias Kier Joffe. This article appeared May 3, 2013, on page M3 in the U.S. edition of The Wall Street Journal, with the headline: Foreign Buyers With Cash Can Tango in ‘Paris of South America’. Roderick Chapman, a 50-year-old marketing specialist from Vancouver, British Columbia, was in Buenos Aires last month, looking at one-bedrooms in the city’s posh Recoleta district. With prices for luxury apartments down by 20% to 25% since last year, according to local real-estate agents, expatriates like Mr. Chapman are finding great buys in Buenos Aires after nearly a decade of steep price climbs. Nicely renovated apartments with parquet floors and terraces in Recoleta—the neighborhood that gave Buenos Aires the moniker “the Paris of South America”—are selling for roughly $185 per square foot, down from roughly $240 in 2008, according to local agent estimates (closing prices aren’t published in Buenos Aires). One-bedrooms in trendy Palermo list for about $150,000 and sell for less. Local brokers offer listings for $200,000 to $400,000 that they say might have sold for 40% more two years ago. Some multimillion-dollar properties are being marketed for nearly half of what was asked just a few years ago. But there is a catch to the new Buenos Aires buyers market, as Mr. Chapman’s house-hunting trip illustrates. “I actually have to cut my trip short, because I’ve run out of dollars and I can’t get any more,” he said. For Mr. Chapman, as for other foreign home shoppers in Buenos Aires, navigating Argentina’s complicated currency landscape is the wrench in the otherwise tempting real-estate works. In May last year, Argentine President Christina Kirchner strictly limited access to U.S. dollars and other foreign currencies in a bid to stem capital flight. With the Argentine peso facing about 25% annual inflation (government figures, widely discredited, set the rate much lower), and an unofficial exchange rate that has effectively devalued the peso sharply, demand is high for dollars. These days, the main feature that foreign buyers say they look for in a Buenos Aires property has nothing to do with closet space or a wide terrace. It is a seller with a bank account outside Argentina to which they can legally wire funds. This is a way to get around having to convert any dollars wired into Argentina into pesos at the official rate, after which it is nearly impossible to convert back into dollars at the official rate. Mr. Chapman has asked brokers to show him only apartments owned by sellers willing to do a foreign-account-to-foreign-account sale. “I absolutely, absolutely, absolutely will not bring my money into Argentina,” he said. The currency situation has spooked some foreigners living in the country. Real-estate agent Pericles Economides said foreign homeowners make up 90% of the sellers in his listings, while local buyers eager to convert their devaluing pesos into more stable real estate make up nearly all his current buyers. Still, in such a climate, foreign buyers find that their dollars—in cash, as mortgages are rare in Argentina—give them market clout. Buenos Aires property developer Gabriel Maioli, a partner at M&M Developers in Buenos Aires, began selling newly built apartments in pesos for the first time last year but offers discounts to buyers willing to pay in dollars, he said. Among luxury apartments currently on the market is the 9,200-square-foot 14th floor of the Art Deco Kavanagh Building, offering sweeping views of the city’s central Plaza San Martín and, on a clear day, neighboring Uruguay across the River Plate. Two of the bedrooms open onto terrace gardens so large their lawns require mowing. The owner, real-estate mogul Alain Levenfiche, put the property on the market in 2008 for $5.9 million but failed to sell it. Today, he is asking $3.3 million. 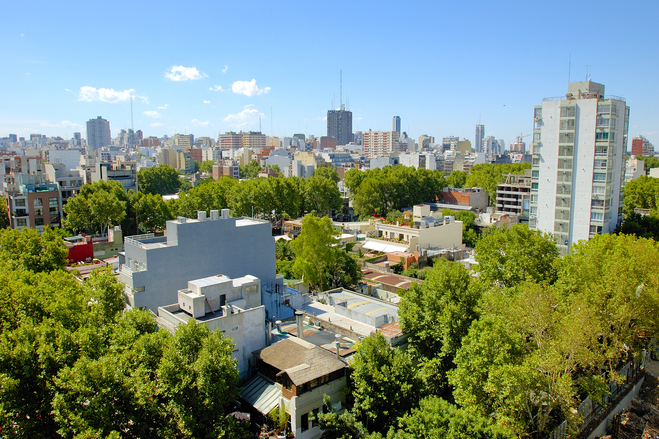 In Palermo Botánico, considered to be one of the city’s premier neighborhoods, a five-bedroom apartment with a bird’s-eye view from a large deck of the city zoo’s llamas, guanacos and condors is on the market for $695,000. American owners Douglas and Janet Choi, both 43, who moved to the city in 2008 for a “personal-growth opportunity” and are now planning a move to London, said they spent $200,000 on renovations that included a modern, granite-topped kitchen and a wood-burning grill on the terrace. Some local agents have called the Chois “dreamers” because of the property’s price tag, estimating that $500,000 is a more likely selling price. Mr. Choi said the family doesn’t have “the need to sell such a special place,” and will rent if they can’t find a buyer before their move to London. Alan Dickinson, a 50-year-old technology sales executive in New York, is looking to buy his second property in the city. “In what other world-class city can you buy property of this caliber at those prices?” said Mr. Dickinson, who raves about the city’s pasta, steak, and “really friendly, inclusive” people. Last month, he met with several Buenos Aires real-estate brokers, instructing them to alert him to distressed sellers looking for a quick, dollar-denominated sale. In 2005, he paid $185,000 for a newly built Palermo duplex with a terrace, finally taking possession in 2009 after construction delays. He lives in it for a week out of every two months and rents it out to tourists the rest of the time. In four years, he has grossed more than what he spent on the unit, he said. In April, two sales Mr. Koh was negotiating on behalf of foreign sellers stalled when one Argentine buyer wanted to pay with gold bars and another offered a studio apartment as partial payment. The hurdles haven’t stopped him from investing. Mr. Koh owned eight properties in the city before closing last week on a ninth apartment. He bought a 500-square-foot, sleekly furnished one-bedroom with a balcony in Palermo Hollywood for $130,000, which he intends to rent short-term to tourists. Richard Maudsley, a San Diego-based real-estate investor, also is undaunted. He arrived in the city in mid-April. Mr. Maudsley, 57, spent a week meeting with brokers and viewing apartments in Recoleta and Palermo, a hip, bohemian neighborhood. But he isn’t pulling the trigger quite yet. He met with financial and legal advisers who can help him quickly close a deal if he spies a bargain. He said Argentina’s property market appeals to him because “it is a cash market,” less likely to be affected by rising and falling interest rates. Nonresidents can purchase property in Argentina and payment can be made between overseas accounts, as long as the sale is declared and taxes are paid. The buying process can take a few months. A buyer signs a purchase contract with 30% down and a notary public does a title check. When the balance is paid, ownership is transferred. Costs include a 1.5% tax on the sale price for the seller, an additional 1.8% federal tax on the buyer and seller, and 1% to 2% in notary fees, paid by the buyer. Brokers for buyers and sellers charge between 2% and 5% of the sales price. Additional annual taxes include municipal and provincial property taxes, as well as a federal tax of 1.5%. Income from rental units is taxed at 21%. There are no capital-gains taxes in Argentina when the property is sold later for a profit. But foreigners need a certificate to sell showing taxes are paid up. This entry was posted in English, Real Estate and tagged argentina, attorney, buenos aires, law firm, law office, lawyer, legal, real estate on May 3, 2013 by Elias Kier Joffe. In 2010, while working to enhance its worldwide internal controls and compliance program, Ralph Lauren Corporation discovered evidence that its Argentine subsidiary had been paying bribes to government officials in Argentina. The bribes, paid through customs brokers, facilitated the entry of RL’s products into the country without necessary paperwork and avoidance of inspections of prohibited products. The bribes were disguised, along with other legitimate charges, as “loading and delivery expenses” and “stamp tax/label tax” on invoices submitted by a local customs broker to RL’s general manager in Argentina. Between 2005 and 2009 RL paid approximately $568,000 in bribes to Argentine officials. Its general manager also provided or authorized gifts to three different government officials, including perfume, dresses, and handbags valued at $400 to $14,000 each, to secure the importation of RL’s products into Argentina. The challenges RL encountered in Argentina are similar to those encountered by many companies operating internationally, as general counsel and compliance officers everywhere well know. The Justice Department and the Securities and Exchange Commission have not hesitated in pursuing Foreign Corrupt Practices Act cases against companies involved in such conduct. (6) ceasing retail sales in Argentina and winding down all of its operations there. In addition, upon learning of the misconduct RL promptly—within two weeks—reported the violations to the SEC and the Justice Department, voluntarily and expeditiously produced documents and transcripts from interviews (translated into English), and otherwise cooperated in investigations by both. RL even made its overseas witnesses available for SEC interviews and brought them to the U.S. According to the SEC’s acting director of enforcement, RL’s timely and thorough cooperation resulted in “substantial and tangible benefits” for the company, including non-prosecution agreements with both the SEC and the Justice Department. In sum, RL agreed to pay more than $700,000 in disgorgement and interest to the SEC, and $882,000 in penalties to the DOJ. These amounts are not insignificant, but they are significantly better than the company might otherwise have faced for a five-year bribery scheme involving hundreds of thousands of dollars. Most important, the company will not face charges and can now put the matter behind it. This is not the first time the government has gone out of its way to encourage cooperation and praise robust compliance programs. In 2012 the SEC and the Justice Department publicly declined to bring enforcement actions against Morgan Stanley MS +0.64% after one of its employees bribed a Chinese government official in violation of the FCPA. That decision was the result, in large part, of the fact that “Morgan Stanley constructed and maintained a system of internal controls, which provided reasonable assurances that its employees were not bribing government officials.” Government officials similarly lauded Morgan Stanley’s cooperation and thorough internal investigation in the case. The lesson to be learned from RL’s recent experience is that a vigilant (re)assessment of one’s anticorruption policies and swift action and cooperation when any misconduct is discovered will continue to be the height of fashion—and function—regarding the FCPA. This entry was posted in English and tagged argentina, attorney, buenos aires, law firm, law office, lawyer, legal on April 26, 2013 by Elias Kier Joffe.